Hey, Capricorns! Do You Know the January Birth Flower? With 2015 coming to a close, we at Teleflora are getting ready to roll out the red carpet for the January birth flower, the carnation. Many expert florists will be the first to tell you that the carnation has come to represent both fascination, admiration and distinction over the years. The flower itself has been cultivated successfully in Asia and Europe for over 2,000 years. There are over 300 species of carnations, which are mostly perennials. They bloom well in full sunlight and drained soil. One unique aspect of carnations is the fact that they come in so many different colors. In fact, you can find a carnation in virtually every color of the rainbow, with the exception of blue. 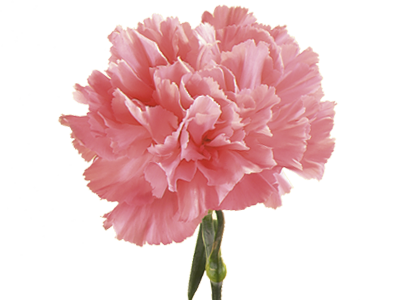 Ohio made the carnation its state flower in 1904. A red carnation is said to honor President William McKinley, a native of Ohio, who was assassinated in 1901. McKinley was well-known for sporting a red carnation in his jacket lapel buttonhole. In addition, the carnation is the national flower of Spain. Caring for your carnations isn’t too difficult. Start by planting or positioning them in an area with lots of sunlight. If the temperature is fairly high, it’s probably a good idea to leave them in a little shade. Just make sure they have plenty of room to bloom (about 10 to 12 inches of separation between plants). Putting them in healthy soil will help foster their growth and keep them alive longer. Water your carnations regularly, making sure they each receive about one inch of water per week. If you’re expecting the carnations to grow tall, using a stake will ensure they grow straight up from the ground. Make sure you keep up on cutting the old flowers off the plants after they bloom. Doing so will encourage your plants to continue blooming and will leave you with a healthier plant overall. You don’t need to worry about replacing carnations every year. Instead, dig up carnation plants once every few years, when you notice the blooms becoming sparse. As we mentioned earlier, carnations come in plenty of different colors. Deep red carnations are considered the classic color of carnation and represent love. White carnations, on the other hand, represent purity, and pink ones are good signs of gratitude. Green carnations are closely associated with festivities around St. Patrick’s Day. Not only are carnations available in different colors, but they come in different sizes, too. Be on the lookout for a mini-carnation if you have a smaller space to decorate. Cotton Candy bouquet – pink and white flowers including roses, miniature carnations and button spray chrysanthemums.